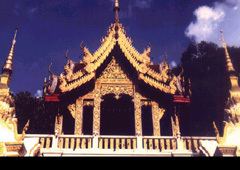 Although I have been to Chiang Mai several times, each time I go I visit Wat Phra That Doi Suthep. Despite it being number one on the tourist hit list for Chiang Mai, it stills beckons me as it stands proudly from the top of the mountain, overlooking the city below. Whenever the golden temple comes into my view as I'm walking along the streets, I'm filled with a sense of peace and contentment, as if it's protecting me. It calls to me, and I go. The songthaew drops me off safely at the foot of the stairs leading up to the temple, after spending many stomach-churning minutes winding along the 13-km steep road through beautiful jungle to reach the summit. I stare at the long staircase in front of me, which consists of more than 200 steps, take a deep breath and begin my ascent, thinking that this isn't as bad as having to climb the entire mountain itself to reach the temple. The staircase is flanked on both sides by the scaly snake-like bodies of the nagas, whose fierce multiple heads form the banisters' bottoms. Thus, the nagas, who in Buddhist mythology protected Buddha before his enlightenment by shooting down lightening bolts aimed at him, guarding the sacred temple. After stopping half-way to catch my breath, sharing exclamations about the strenuous climb with other tourists, I finally reach the top and enter the temple grounds, first taking off my shoes. 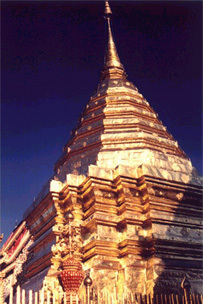 The temple is breathtaking in its gold and vermillion splendour, twinkling in the sun's gaze against the deep blue sky. Wiping my face with a handkerchief to catch the beads of sweat dripping down, I enter the inner courtyard and am greeted by the sight of the copper-plated chedi topped with a five-tiered golden umbrella, glinting like golden fire. All around it are throngs of tourists, and I must maneuver my way through to get a good view. Leaving the inner sanctuary and the chedi, I head outside of the main temple where I had been told I would see a fantastic view of Chiang Mai. Passing by a holy Bodhi tree, which people say had actually grown from a clipping of the very tree under which Buddha became enlightened, I come across two rows of large bells. 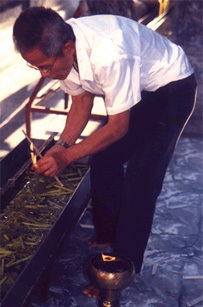 A young man grabs the gong of the first bell and gently taps the side, creating a resonating sound. As he continues along the row, ringing each bell lightly, the sound follows me as my eyes draw me to the bright pink bougainvilleas that reach their limbs and paper-thin petals to the viewpoint.